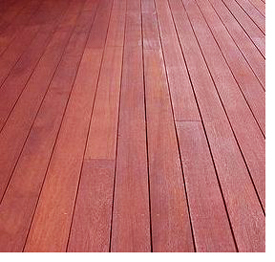 Red Meranti is the most popular 'mahogany' sold for decking. Its mahogany-like characteristics and low cost make it ideal for many decks. But, it does require finishing and periodic refinishing to keep it looking good as new. An initial factory pre-finish prior to installation is preferable because every exposed surface of the deck can be coated and protected, not just the top, offering a more appropriate level of protection. With that in mind, we are pleased to present Red River. We listened to our customers who told us about callbacks, odd lengths, and other headaches they associated to mahogany. We set out to improve quality, coating and tally, and succeeded. We're excited for you to try Red River - we know you'll agree it's an upgrade. Red River's hybrid two-coat process is designed to far outlast standard penetrating oil stains which typically require recoating the very first season of use. It's just one of several ways we've reinvented meranti decking with the dealer and homeowner in mind. Hybrid coating can be expected to substantially outlast penetrating oil coatings, without peeling like film coatings. Clear, all-heart grade means you're getting the best Red Meranti there is - no inferior sapwood. All even lengths, 8' and longer, makes it an easier item to stock without risking getting stuck with less-desirable shorts and odd lengths. Learn more about Red River™ decking - meranti decking perfected!